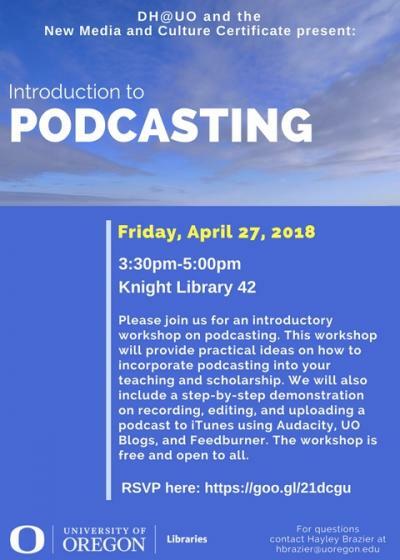 Please join us for an introductory workshop on podcasting, hosted by Digital Humanities (DH@UO) and the New Media and Culture Certificate (NMCC). This workshop will provide practical ideas on how to incorporate podcasting into your teaching and scholarship. We will also include a step-by-step demonstration on recording, editing, and uploading a podcast to iTunes using Audacity, UO Blogs, and Feedburner. The workshop is free and open to all​.